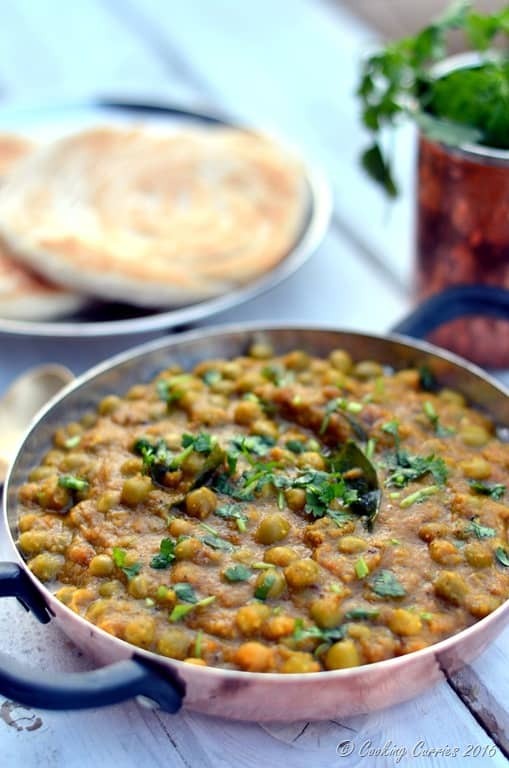 This delicious and creamy Kerala style Peas Masala Curry made with dried green peas, spices and coconut milk is a wonderfully simple side for chapatis, Kerala porottas or Idiappams. There was no particular moment that I fell in love with this dish. 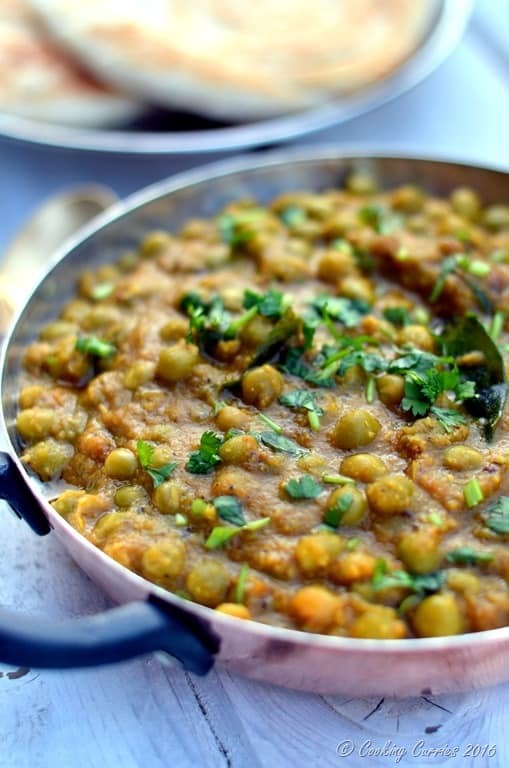 There is something about that slight sweetness and heartiness of the green peas along with the coconut and that mild heat from the spices that you cant help love. It is such a well balanced dish. And I remember always loving it. This was one of those dishes that we always got take out from restaurants and never made at home. 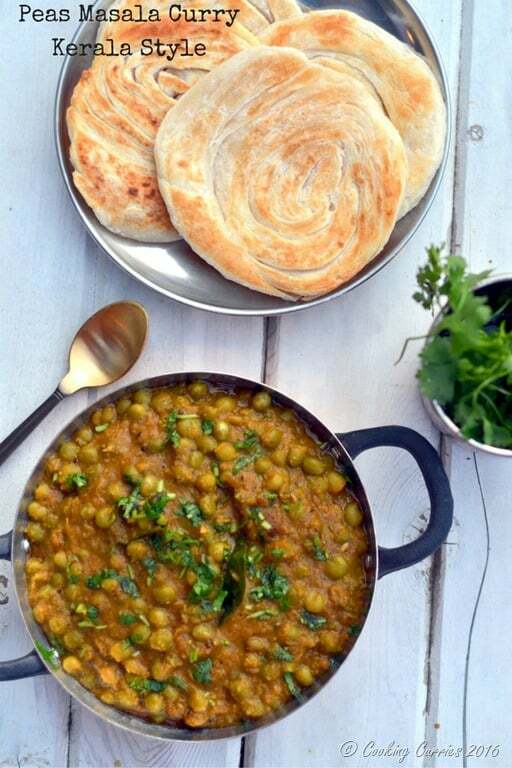 Appa would sometimes get this on his way back home from work, some peas masala curry and porottas, for our dinner. Those were the days my brother and I would wait for. We could see him walking back home as soon as he turned a corner from the road. We would try to spot a packet in his hands. Depending on the time he got back, whether it was evening snack time or later closer to dinner, that little packet would have something different. It was either cutlets or pazham pori ( ripe plantain fritters) for snack time or this peas masala and porotta or vegetable kurma and porotta for dinner. I don’t remember what occasions made him bring these back home for us, as we were very much the “eat most meals at home” kinda family. Maybe those were the days that Amma was gonna be late from work and she must have asked him to pick something up on his way. We rarely bothered to find out what the reason was. These were some of our favorites and we always loved it when he brought something back home for us to eat. Amma’s area of expertise in bringing something back home to us were cakes and pastries!! Saturdays were half days for her, which meant she would be back home by 4 or so and she would always bring back a box of pastries or cakes from Supreme Bakery in Kollam, a town that she worked in. And oh my, how we would gorge on them! Enough with the stories and lets get on with the recipe. Is there any such stories that certain foods remind you of? Let me know in the comments! 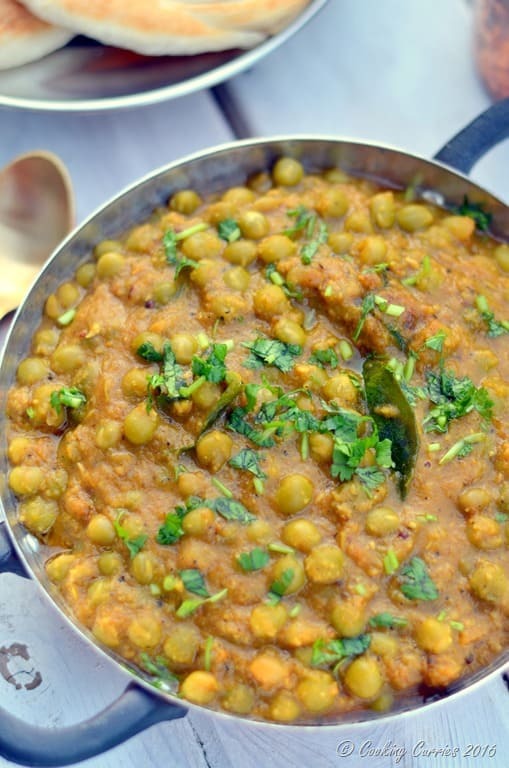 Soak the green peas in water overnight or for 3-4 hours. Rinse them out and pressure cook them with water till they are soft and cooked through. Heat the 1 tbsp oil in a deep heavy bottomed pan. Add the onion, ginger, garlic and green chillies and sauté till the onions are soft. Remove from heat and let cool. Grind them with a little water to a smooth paste. Heat the 2 tbsp oil and add the curry leaves to it. Add the ground mixture and the turmeric power, cayenne, cumin powder and fennel powder to it. Mix well and let it cook for a few minutes. Add the tomatoes and let it cook till the tomatoes soften. Add salt. Now add the coconut milk and the cooked green peas with the water (there shouldn’t be no more than a cup of water, drain if there is more). Let it cook till it all bubbles up. 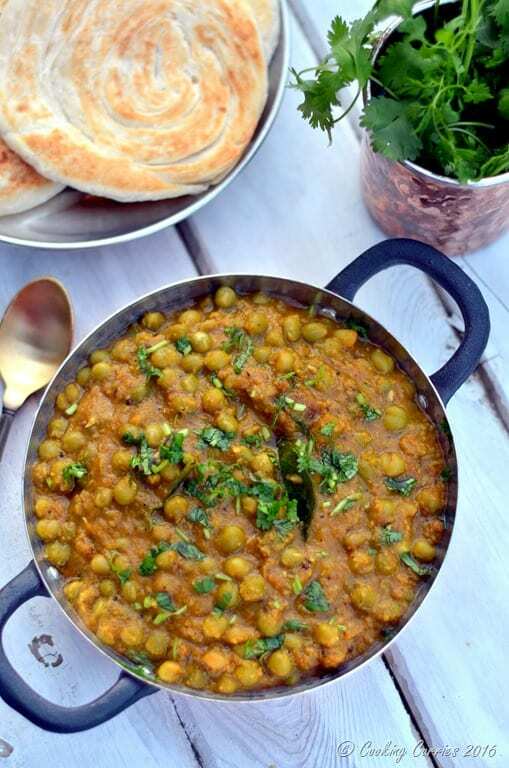 Garnish with cilantro and serve hot with porottas, chapatis or idiappams.